American Racing 24.5 x 8.25 "Alcoa Style" Semi Truck Rims to fit the steering axle. 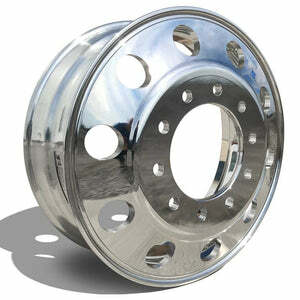 These Heavy Duty Forged Wheels come High Polished with Caps & Covers with Free Shipping! American Racing ATX Series Aluminum Semi Truck Wheel that Includes Hub & Lug Covers The strongest and toughest wheels in the industry. Through the highest quality forged 6061 alloy available combined with years of experience in engineering high performance racing wheels ATX has maximize strength to weight ratios and provide some of the highest load limits in the industry. Influenced by American Racing original Indy car wheel with the legendary oval windows. This is the standard 11r24.5 rim that will fit the Front (Steer) position of most new trucks.